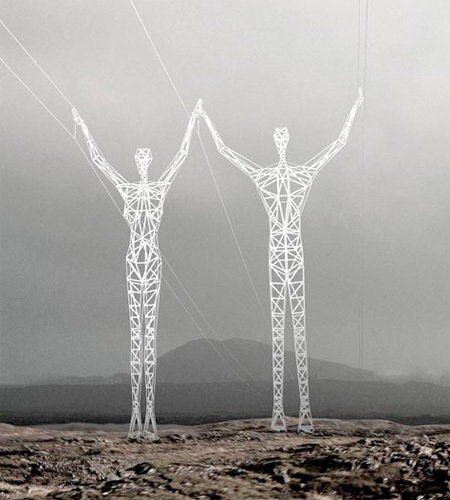 Creative electricity towers designed by Choi+Shine architects look like giant people that hold overhead power lines. 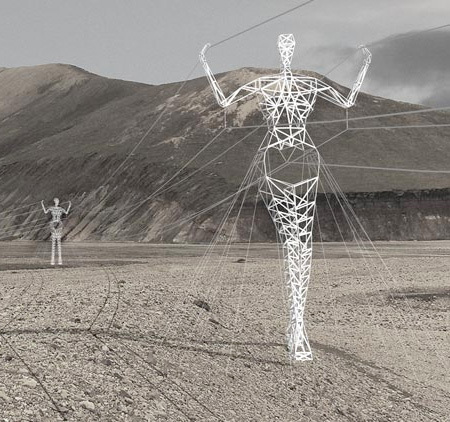 If the project gets approved, existing transmission towers in Iceland will be modified and transformed into male and female statues. Modular design will help minimize construction and maintenance costs. 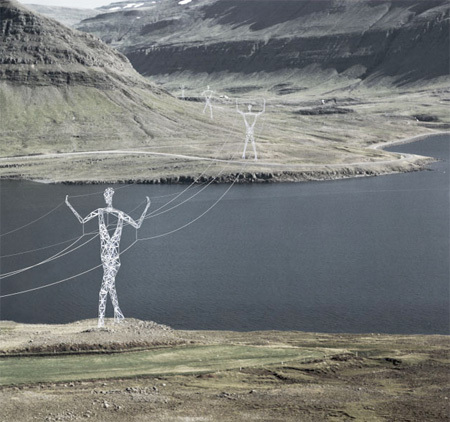 Beautiful pylon figures will become monuments in the “Land of Giants”. then battle-armors, lasers and missiles. hmmm….i’m imagining each tower has a different martial art pose. but if we follow it, it was a combination skill from martial art. and imagine those was over the world and each region has difference style pose. Maybe they should focus more on the safety of power lines than making the structures that hold them more attractive. I agree with ‘reason’ and the structures look a bit top heavy. I don’t know how structurally sound the figures are, but that should be more important than aesthetics. If one were driving along in the country, it would more interesting to see these them just one normal tour after another. I think these are wonderful. Awesome! That’s art where we need it. Injecting creativity into mundane infrastructure is a good thing. That is creative use of are that I could enjoy. Similar to Street are or fire plug painting… I like the concept. There’s lots of desolate land in Iceland so depending on where they put these up it could be a great use of space and draw tourists. Clearly you can’t ignore the primary function of these structures, but it’s always great when you can inject creativity into common, mundane items. 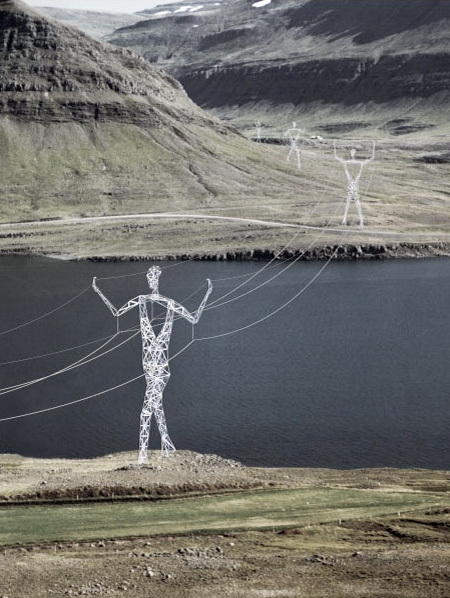 If they need to go to all this extra effort, why not bury the power lines instead. Then people could view beautiful unobstructed nature instead of ugly giant statues. ok, I rather not see any structure obscuring the nature, but if there must be a structure, one that has come from an artist’s mind and soul is better than one that hasn’t ! I dont know why people are complaining. . .
wooooooooooow that is very good.